Brandeis University’s Special Collections is home to over 10,000 rare books, a host of treasures which includes myriad first editions, holy texts, incunabula, miniature books, illustrated manuscripts, and early Shakespeare folios. Among these gems lie twenty-two books boasting a rare, hidden, and little-known art form: fore-edge painting. 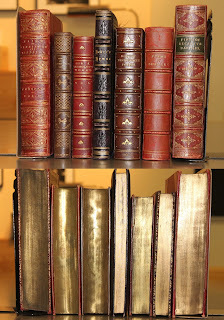 A recent donation of the Reuben M. and Regine Ginsberg Collection of Fore-edge Painted Books, made by Michael Ginsburg (Brandeis Class of 1970) in honor of his parents, greatly enhances Brandeis’s existing collection of these unique and spectacular volumes. While bibliophiles may be familiar with the gilt edges often found on antique books, many may not know that this gold finishing sometimes hides a secret painting (or even two!). Fan the pages of a book with a fore-edge painting, and who knows what you may find…images of children playing in the snow, a lovers’ embrace, a family crest, a portrait, a landscape, a famous landmark, a battle scene, and much, much more. The fore-edge is the edge of the text block opposite the spine (if you think of a book as having four edges, they are the spine, top edge, bottom edge, and fore-edge - this last being the edge you use to thumb through the pages) and fore-edge paintings are artistic decorations meant to enhance a volume’s beauty. These paintings are added by artists to individual books and might have little to no relationship to the subject of the book itself. Depending on the artist’s employer (the bindery or the owner), these paintings could be added before or long after binding. Rarely signed, fore-edge artists and dates are usually identified by style. (1) Brandeis’s collection consists mostly of 19th-century books with contemporary and later paintings. Some fore-edge paintings are visible when the book is closed, but usually, the paintings are disguised by gilt edges. These latter are referred to as “disappearing fore-edge paintings,” and can only be seen when the pages are slightly bent. A slight misnomer, the “fore-edge paintings” of the disappearing variety are actually painted not on the book’s edge, but rather, just inside the edge of the pages. Disappearing versions began to appear in the 17th century. Believed to have originated in the title markings applied to fore-edges in the 10th century, the art of fore-edge painting began as a utilitarian procedure - mostly a method for identification, rather than beautification. Before book spines were regularly marked with books’ titles, fore-edges were used for this purpose and the books were shelved with the fore-edges facing outward so that the titles were visible. Later, when titles were shifted to the spines, the fore-edge began to be used to as a place to list book owners’ names (or their family mottoes, coats of arms, monograms, etc. ), as books were luxuries and it was useful to identify ownership. When a 16th-century Italian engraver and painter named Cesare Vecellio (cousin to the famous painter Titian) began painting the fore-edges of books, the purpose of fore-edge markings shifted from identification to beautification. Vecellio’s paintings, like the early practical markings of title and owner, were painted on the very edge of the pages, so as to be visible when the book was closed. Around a hundred years later, in England, Samuel Mearne, a bookbinder of the Restoration Period (and one of the “Queen’s Binders”), added a new skill to the existing art. He began to paint, not on the absolute edge of the text block, but just within the inner edges of the pages. This shift in technique resulted in artwork which was visible only when the pages were fanned and undetectable when the book was closed. Thus, the “disappearing fore-edge painting” was born. Over the next couple of centuries, fore-edge paintings grew in popularity. “The famous bookbinding firm, which is always referred to with ‘the territorial suffix’ Edwards of Halifax, was responsible for this surge of interest. Artists were employed to paint landscape scenes with country estates on the fore-edges of books, which were then handsomely bound in painted vellum covers or in exotic leather bindings.”(2) While they continue to be a relatively rare art form, fore-edge paintings are still being created today, usually added to antiquarian books, making the painting significantly younger than the book itself. Single fore-edge paintings, whether hidden under gilt or not, provide, as their name suggests, only one image. A double fore-edge painting delights the viewer with two: one image which appears when the pages are fanned in one direction, and a second image when the fanning is reversed. The triple fore-edge painting adds a third image which takes the place of the gilt edging and is visible when the book is closed. 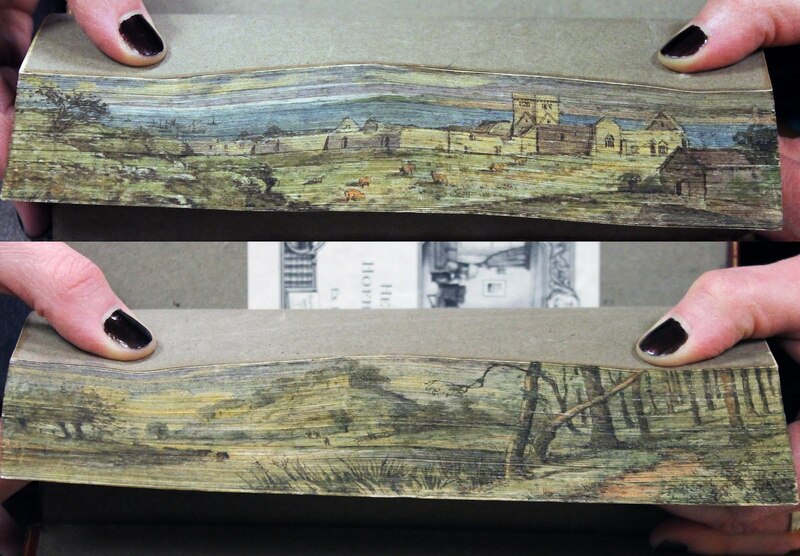 There are also “panoramic fore-edge paintings” which occur not only on the fore-edge but the top and bottom edges of the book’s pages as well. Perhaps due to their hidden nature, there has been relatively little written and there is relatively little known about these stunning pieces of secret art. They are a rare commodity usually found in rare books and special collections libraries. Owners of books adorned with fore-edge paintings may not even be aware of the treasures they hold. Brandeis’s small but stunning collection provides a peek into this special art form and should prove of particular interest to scholars of art history, bookbinding, and antique literature, as well as all lovers of books and beauty. The Reuben M. and Regine Ginsberg Collection of Fore-edge Painted Books is currently being cataloged, but the list is available upon request. 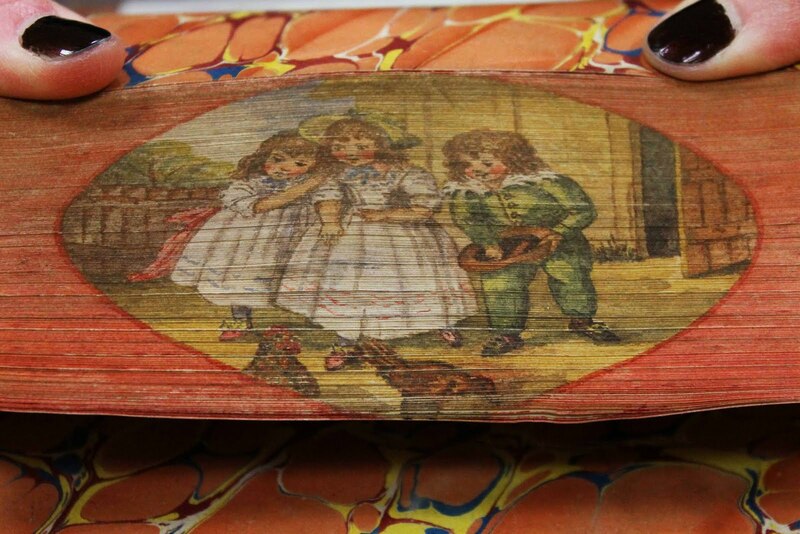 The currently cataloged fore-edge painted books in Brandeis’s collection can be found here. “An Artistic Edge: Selected Fore-Edge Paintings at MSU Special Collections.” In Adversaria: Special Collections Provenance at MSU · Tracing the Trajectory of Rare Books at Michigan State University. Michigan State University, February 21, 2014. (1 & 2) Bromer, Anne C. “Fore Edge Painting - An Introduction” in On the Edge: The Hidden Art of Fore-Edge Book Painting. Boston Public Library. Carswell, Beth. 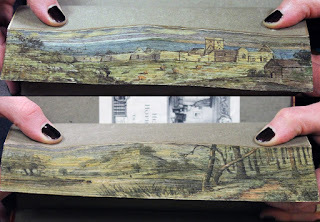 Fore-Edge Paintings: Beauty on the Edge. Abe Books. Carter, Michael. “A (Disappearing) Fore-edge Painted Book at The Cloisters Library.” The Cloisters Museum and Gardens, August 6, 2014. Frost, Martin. “What Is A Fore-Edge Painting?” in On the Edge: The Hidden Art of Fore-Edge Book Painting. Boston Public Library. Roberts, Matt T. and Etherington, Don. 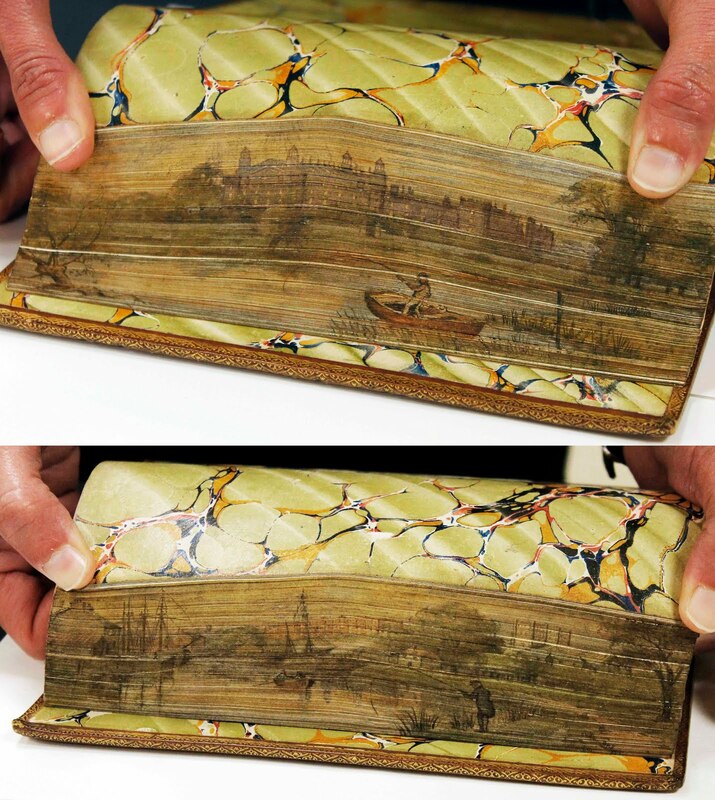 “Fore-edge Painting.” Bookbinding and the Conservation of Books: A Dictionary of Descriptive Terminology. CoOL: Conservation Online, Foundation of the American Institute for Conservation of Historic and Artistic Works (FAIC), November 19, 2011. Weber, Carl J. Fore-Edge Painting, A Historical Survey of a Curious Art in Book Decoration. New York: Harvey House, Inc, 1966. Research by Hansol Lee, undergraduate student in Biochemistry and Archives & Special Collections assistant; research and description by Surella Evanor Seelig, Archives & Special Collections Outreach Librarian.